TreadSafe® abrasive coated stainless steel stair nosings are playing a key role in preventing slips, trips and falls in the Corby Cube. 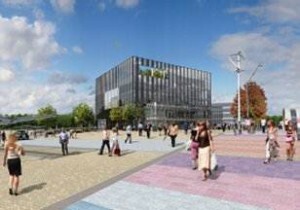 This 21st century civic development, interlinking council administration, commercial facilities and cultural activities, is part of a £50 million regeneration project in Corby driven by the North Northants Development Company. The building includes contemporary offices, a theatre, library, council chamber and marriage room. The Corby Cube was designed by the architectural practice HawkinsBrown and has already received international acclaim, being runner-up to the Beijing Olympic Swimming Pool in the 2007 LEAF Awards for the Best Public Building Design of the Year. The building comprises eight levels – two below ground and six above. TreadSafe® stair nosings are embedded into the pre-cast concrete stairs throughout the building in both fire escape and general access areas. Nosings are finished in high visibility yellow paint to meet the requirements of the Disability Discrimination Act. TreadSafe® abrasive coated stainless steel nosings were selected for this project because of the requirement for a very durable and rugged non-slip surface on the pre-cast concrete stairs.